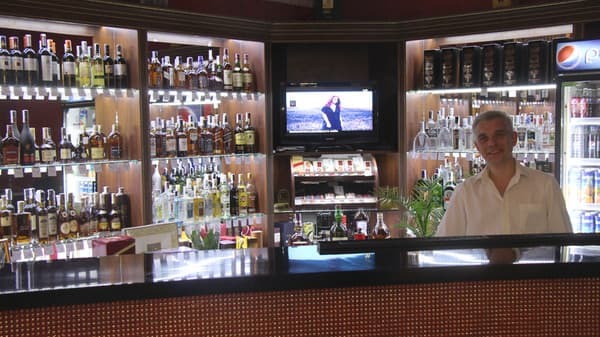 The hotel and restaurant complex "Sobkoff" is located 900 meters from the bus station. The hotel has 45 rooms of different categories. The complex consists of 3 buildings. In the administrative building of the complex there is a reception and standard rooms. 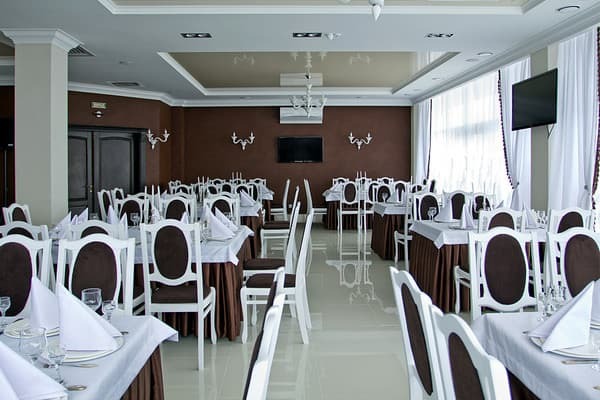 In the central building of the complex there are two restaurant halls with dishes of Ukrainian cuisine, as well as VIP rooms, and a summer terrace. 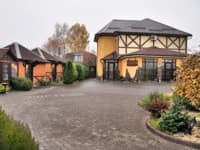 And in the main hotel complex the main room fund and sauna with laundry (services are paid). There is a covered area on site with an equipped children's play area. The hotel offers free 24-hour parking. Guests can relax in the fresh air near the lake with an artificial waterfall. 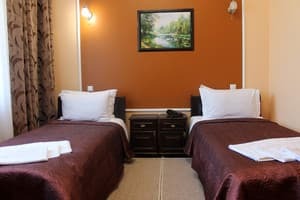 The hotel and restaurant complex "Sobkoff" is located 1.3 km from the central railway station and 3.5 km from the city center. 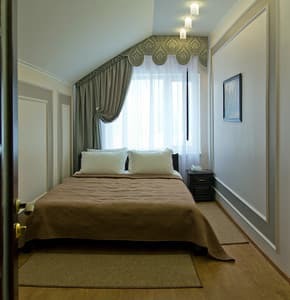 Description of the room: The cozy room is equipped with a large double bed. 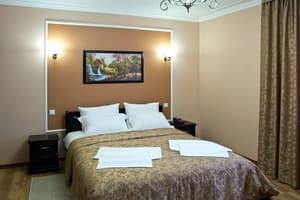 Description of the room: Comfortable room with two single beds. 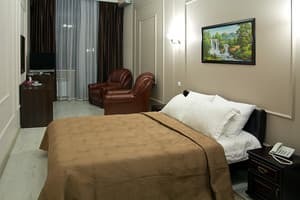 Description of the room: Comfort room is equipped with a double bed. Description of the room: Comfortable one-room with new furniture, overlooking the orchard. Description of the room: Comfortable room with new furniture overlooking the orchard. 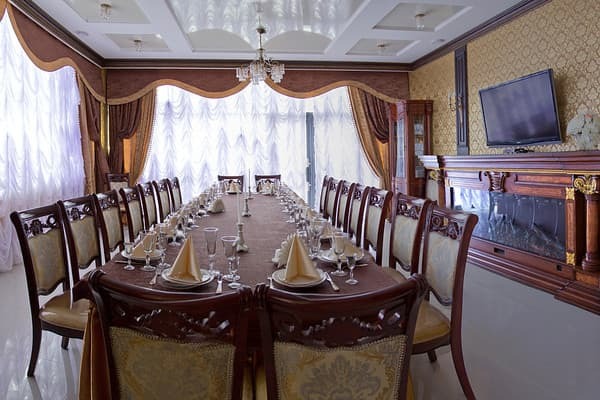 Description of the room: The wedding room is equipped with a double bed, a bathroom with a jacuzzi. The room has a view of the city and the garden. Понравилось все! Отель отличный - выше ожиданий. Все на уровне. Чистота, во всех номерах кондиционеры, очень красивая территория, внимательный персонал, хороший ресторан и вкусный завтрак. Останавливались в нем повторно, и если будем в Хмельницком еще - обязательно будем опять. Не было того, что бы не понравилось. 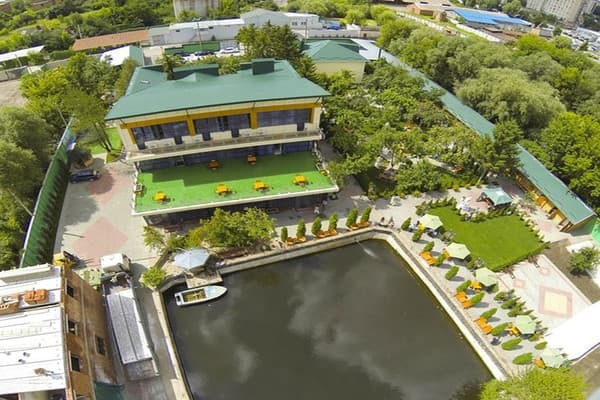 There is a restaurant on the territory of the complex, where Ukrainian national cuisine is served. 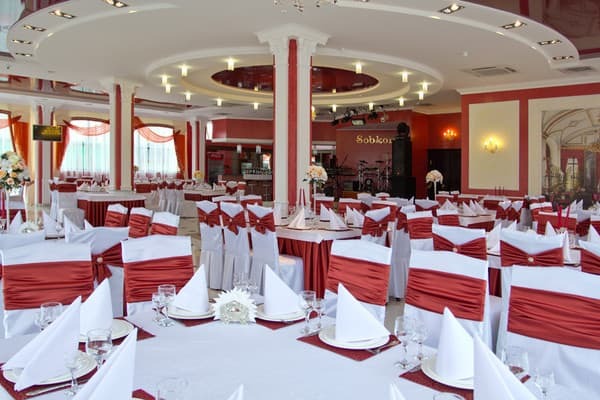 Hotel and restaurant complex "Sobkoff" is located near the city center, 10 minutes walk from the railway station. The hotel-restaurant complex is located at a distance of 900 m from the bus station and 3.5 km from the city center. The hotel is best reached by car or by shuttle bus number 2, which rides through the city.